Each plugin has an associated TSP object to communicate with the Transport Stream Processor main executable. A shared library must exclusively use the tsp object for text display and must never use std::cout, printf or alike. 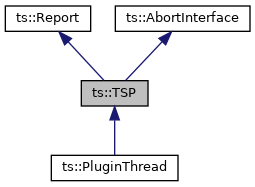 When called in multi-threaded context, the supplied tsp object is thread-safe and asynchronous (the methods return to the caller without waiting for the message to be printed). A plugin can decide to terminate tsp on its own (returning end of input, output error or ts::ProcessorPlugin::TSP_END). The termination is unconditional, regardless of the state of the other plugins. The idea behind "joint termination" is to terminate tsp when several plugins have jointly terminated their processing. First, a plugin must decide to use "joint termination". This is usually done in method start(), using useJointTermination (bool) when the option --joint-termination is specified on the command line. When the plugin has completed its work, it reports this using jointTerminate(). Implemented in ts::tsswitch::InputExecutor, ts::tsswitch::OutputExecutor, and ts::tsp::JointTermination.